Part of being a caregiver means that you’re coordinating all the information that other family members need to have. One of the most effective ways to do this is through family meetings, but those can get complicated if you’re not careful. The first step is often determining who needs to be involved in the meeting. Caregiver Alpharetta GA – Who Should Be Involved in Family Meetings? What’s Your Definition of Family? Every family is different and your senior’s family might be more traditional with kids and grandkids making up their support system. Or the family might be made up of more “chosen” family members. Regardless, when you’re putting together a family meeting, it’s important to consider who your senior’s family truly is. Some aging adults don’t want to be bothered with family meetings about their situation, but this isn’t something you should assume. Talk to your elderly family member about whether they want to be involved in these family meetings or not. If the meeting is solely informational and family members aren’t involved in making decisions, your senior may sit the meeting out. If you’re going to be making decisions, though, you’re going to want to keep them involved. You might be surprised to find that some family members aren’t willing to be as involved in these family meetings as you would like them to be. It’s important for you to realize that as much as you might want to, you can’t force other people to attend these meetings and to give you input into what’s going on. Even if you could, they might be disruptive to the entire process. Your guest list might change from meeting to meeting simply based on what you’re going to cover. Some family members might be fully involved in helping your loved one to get where they need to go, for instance, so you would definitely include them in a meeting where you’re discussing your senior’s upcoming appointments. They may not be interested in other types of meetings, but planning out transportation is crucial. 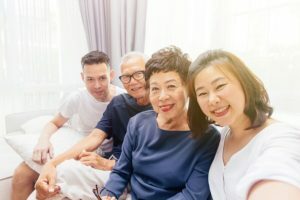 Ultimately as the primary family caregiver, you might want to experiment with a variety of different types of family meetings to find the combination that works best for your family’s situation. You may also find that your family responds better to something a little different, like a Facebook group with private settings. In the end, it’s about keeping family members informed. If you or an aging loved-one are considering Caregiver Services in Alpharetta GA, please contact the caring staff. Email: info@realmccoyhc.com • Phone 404-536-1060. The Real McCoy Home Care is your locally owned and managed in-home, non-medical home care agency. Serving North Metro Atlanta. ← Is Your Aging Adult Using Her Cane Correctly?